People might be wondering about what is meant by the availability of Samsung Galaxy gadgets in United Kingdom as Samsung Galaxy is one of the most popular handheld smart devices launched by the company. There is no need to worry because the retailers like Expansys and Clove are now selling the camera of Samsung Galaxy and people can easily avail the benefits of best quality cameras. People must not confuse the camera with smart phones. Samsung has successfully made the cameras available for general public which have the capability to run different Android applications. Talking about the specifications, it can be said that the cameras from the house of Samsung Galaxy, like the sensitive cameras of Smart phones are equipped with high storage capacity. The memory of the camera is almost 1 GB and the chipset of camera is almost 1.4 GHz. The storage capacity can further be extended on the basis of requirements of clients and 1280X720 dimensions further facilitate the people to capture unique quality images. 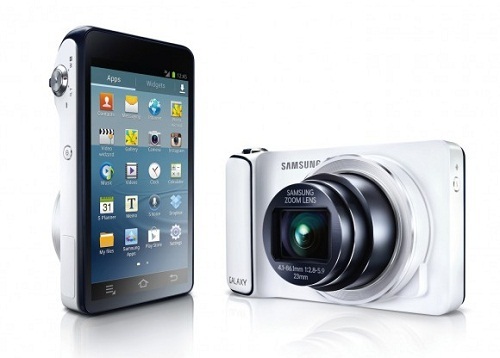 The networking options of the Samsung Galaxy camera are also exceptional because individuals can utilize HSPA networking systems for sharing their memories. One of the best features, which can be declared as the competitive features of Samsung Galaxy camera, is its highly sensitive sensors. The camera has multiple zooming capabilities can zoom the objects almost 21 times more than the normal cameras available in the market. In addition to this, the sensor equipped in the camera is of 16 mega pixels supported by Xenon flash options. Most of the critics say that the performance features of the camera are not according to its price, but still it has the capability to show exceptional performance as compared to the other competitive options. The introductory price range of Samsung Galaxy camera is similar to the other cameras and it is available with all major retailers at £399. The colors of the camera are also attractive and the supporting cases and leather pouch are available with the camera. Hence it can be said that to the segment which is keen to obtain latest and high quality camera devices, this is a perfect option which is not accessible to them. The attractive colors are highly preferred by the market and it is expected that Samsung will be able to uphold the tradition of immediate sale of all the available units in the market. The shipment services are important for the consumers as the tradition of distant shopping is increasing day by day. People can simply order the desired products from the well known outlets and ensure the availability of products on instant basis. It is expected that people will soon be the beneficiaries of the shipment services provided by Clove and Expansys since November 12th and November 18th respectively. The interested customers can book their orders in advance and become the beneficiaries of discount offers provided by the retail outlets. As a result they can save considerable amount of money.